Frequently Asked Questions – Shop. Learn. Experience. Do you have the dates for 2020? Yes, the 2019 Expo will be February 27 – March 1, 2020. What are the hours of the Sewing & Stitchery Expo? The gates to the fairgrounds open at 8:00am. Please note, the shopping floor hours do not begin until 8:30am. What is the cost of admission tickets? $14 at the door, or $12 pre-sale through online, mail-in registration, or at selected fabric and quilt stores. A 4-day pass is available for purchase through the website. Is my admission ticket good for all four (4) days? You need to purchase an admission ticket for each day you plan to attend. A four-day pass is available for purchase for $42 through the website. Do children need to pay for admission tickets? Children 10 and under are admitted free onto the grounds. If you attend a class, you must purchase a ticket for your child. Parking is FREE, courtesy of the Sewing & Stitchery Expo! Where can I find the class descriptions and schedule? You can find the PDF version of the 2018 class catalog here. The 2019 brochure will be released in December. Register to be on the mailing list to receive a hard copy. Sign up for the newsletter here to receive notification of when the catalog is posted. Online registration will open Tuesday, January 8th at 8:30am PST. You can sign up for the newsletter here to be notified when tickets go on sale for future Expos. No refunds will be made for lost, forgotten, or unused or stolen tickets. A $2 fee will be charged per class for ticket replacement. I am planning on taking a Three- and Four-Needle class. Under student supplies, it lists “basic sewing supplies.” What do I really need to bring? 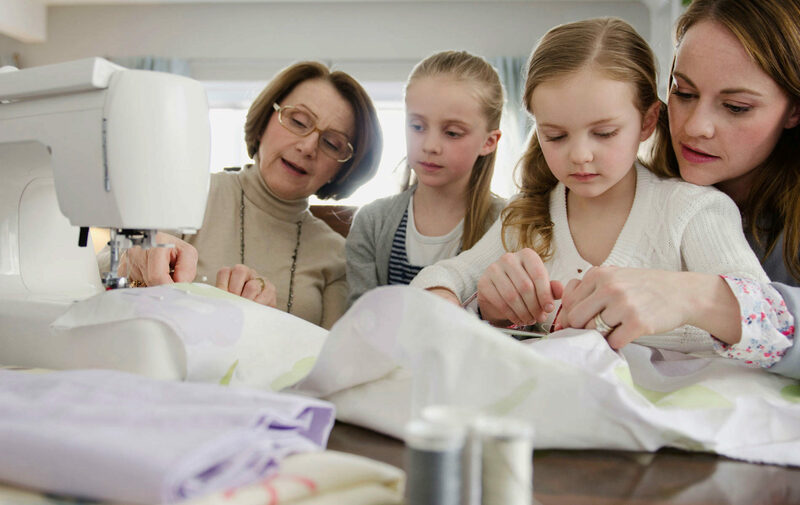 Basic sewing supplies means to bring scissors (fabric & paper), pins, seam ripper, chalk, seam gauge, ruler, measuring tape, sewing needles, etc. Optional: portable light, mini iron and ironing pad, and anything else you use that will make your sewing experience pleasurable. Rotary cutter, mat, ruler, irons, and ironing pads are available for classroom use. What’s your best advice for first-time visitors to the show? Register early! Many of the classes fill up very quickly. Sign up for the newsletter to receive updates on when tickets go on sale. Wear comfortable walking shoes, and plan your schedule with the fairgrounds map in hand. Use the Package Check for hands-free shopping. Use the Expo Show Guide (handed to you at the door) to help you make the most of your time at the show. Take advantage of the FREE style shows upstairs on the Expo Runway, Second Floor Pavilion building, and the Free Stage events in the Showplex building near the Ticket Booth (Door D). Are there food booths at the fairgrounds? Yes, there is a nice assortment of food vendors located on the fairgrounds. Is there a photo policy? When you buy a ticket to attend the Sew Expo, you may be photographed by the show management while shopping, attending classes, or at special events. These photos may be used in future advertising or promotion of the Expo. Please note that individual vendors and teachers may choose to not allow pictures in their booth or class. Please respect their wishes. Are wheelchairs available, and how much do they cost? I have ADA needs. What do I need to do? Persons with ADA needs should call WSU Conference Management at 866-554-8559 as soon as possible. Requests must be made at least two weeks prior to the show. Can I bring my wheeled tote? For the security and safety of all attendees, vendors, and Expo staff, we request that you leave carts, carriers, and suitcases at home or at your hotel. Purchases may be checked at the Coat & Package Check Booth located on the first floor of the Fair View Building. Only service animals will be permitted entry to the fairgrounds. I am coming from out of town. What hotels or motels are nearby? Visit Accommodations for a listing of local hotels, motels, and RV parks in the area. Is there parking for my RV? RV parking is available at the Washington State Fairgrounds. Call 253-845-1771 for more information. How can I contact a teacher or vendor after the Expo? The at-the-door Newspaper has a list of the teachers/vendors with the phone numbers and addresses. You can also check the website for a list of vendors. Is there a shuttle to Expo? No, there is not a dedicated shuttle. However, there are local transportation options such as the Puyallup Connector and Sound Transit Buses.